In Part 1 of this interview, Wes talks about his early training and his life in the martial arts. I am sitting here with NYIA instructor Wes Tasker. Over the years Wes has become a good friend. He regularly comes down to New York City to study Xing Yi and Ba Gua and we have spent countless hours exchanging techniques and working together on Chinese weapons skills. More recently, I have been learning the very interesting Bai Yun Ba Gua method from Wes. Many of our New York City students know Wes because he assists me in teaching Xing Yi and Ba Gua seminars, and has taught the basics of the Ba Gua Jian (Straight Sword) and Dao (Saber). Wes is a font of information on various martial arts, a formidable martial artist and an excellent teacher. Needless to say, we both learn from each other and he has been – and continues to be – an important influence in my understanding of Ba Gua, Xing Yi and other arts. Wes has a very extensive and impressive background in martial arts. He has studied American Kempo, Kosho Shorei-ryu Kempo, and various styles of traditional Okinawan and Japanese Karate. 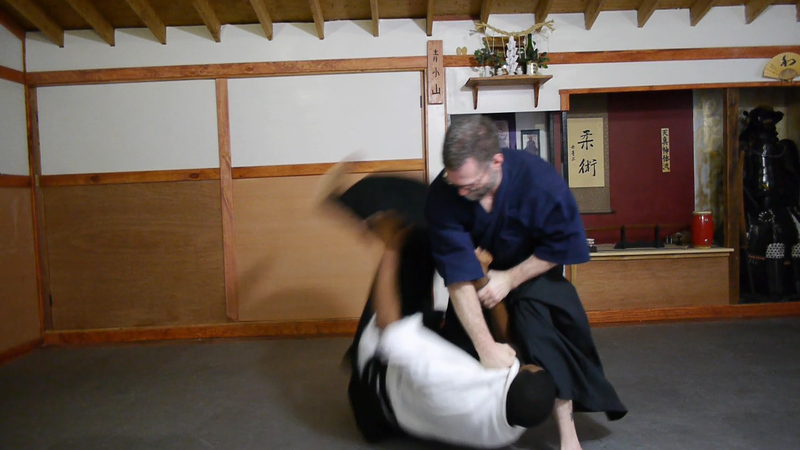 Wes also holds a teaching license in a traditional Japanese Bugei system. He is an instructor in various styles of Filipino martial arts and six different Pentjak Silat styles. Wes is an instructor in Quan Chu Xing Yi Kuntao, Bai Yun Ba Gua and Qi Lin Pai Quan Fa. As a representative of New York Internal Arts, Wes is an instructor in Shanxi Xing Yi Quan of Li Gui Chang and Liang Zheng Pu Ba Gua Zhang. He has also studied Western Boxing and Catch Wrestling. Tom Bisio (TB): You started martial arts when you were a child. How old were you when you began to study and what were the first arts you studied? Wes Tasker (WT): I started studying martial arts at age nine. I started with my parents, in Fred Villari’s Kempo system. We took a family course with another family up the street. There were nine of us training together between the two families. After a time, the others stopped training, but I continued, until it became too much for my parents to drive me to the dojo. However, just as that happened, another studio opened up just down the street from our home, so I could walk there. That was a different Kempo system, one that mixed Ed Parker’s American Kempo with Shorin-Ryu forms. I did that for about three to four years. TB: What led you to move on to other martial arts? WT: When I was a Brown Belt we were visited by students from Nakayama Sensei. They were interested in exchanging techniques. They wanted to learn more about Kempo’s rapid fire hands, and I was interested in improving my ability with joint locks and throws, which they were very good at. TB: And Sensei Nakayama taught? WT: He taught Nakayama-den Bugei, which refers to the martial arts he transmitted, the main one being Tenshin Shintai Ryu, a classical Japanese system. He taught and transmitted more than just the methods of that Ryu, so I refer to his teachings as Nakayama-den Bugei. WT: Nakayama Sensei was running a commercial school with a toned-down curriculum, as opposed to the traditional curriculum. I learned from his students. I was about twelve at the time and was a brown belt and assistant teacher at the Kempo school. I then went on to study directly with Nakayama Sensei in his group classes. Soon after he reverted back to teaching the more traditional way – and within a few months I was the only student left. Part of the reason for that is that the curriculum in his Bugei is immense. Just to learn to receive the locks and throws is an art unto itself. I trained with him until 1989, when he left the country. I was then eighteen years old. TB: I remember you telling me something about doing sword cuts before going to school. WT: When I was in middle school and high school, between the ages of 12 to 18, I would get up in the morning and do 1,000 sword cuts with a wooden suburito (a heavy wooden sword), and then practice hitting a tire with connection to Dantian, so the sword cuts would not bounce back. TB: Didn’t you try out some of the traditional Japanese sword and spear techniques in a Creative Anachronism competition? WT: I had a friend who did Creative Anachronism. He invited me and it was a fascinating and eye-opening experience. The stuff works! In the art that I came up in, we did not free-bout with bokken. In fact, traditional Koryu contains a bit more free-style element then people think, but there was no gearing up and all-out sparring. It was amazing how, only having experienced a lot of two person kata, it worked against people who trained primarily by free-bouting (sparring). TB: And latter you started to teach Nakayama’s art? Well, I tried casually teaching his commercial version of the art to various friends of mine, but no one lasted very long. I didn’t get any serious students in that method until the late 90s. I currently have two students who finished the whole system. TB: Meanwhile you studied other arts? WT: When Nakayama left, I liked the Japanese martial arts, so I wanted to stay within that purview – but wanted do something a little more relaxed. I ended up studying Aikido and Judo and any style of traditional Karate I could find. I studied Matsubayashi-Ryu, Goju-Ryu and Uechi-Ryu Karate. In 1990, I went to a Small Circle Jujutsu camp with Prof. Wally Jay. I was not a formal student of his, but attended several four-day camps over the years. 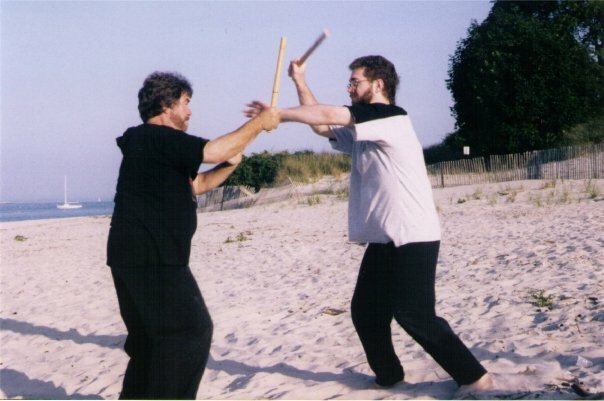 At one of those camps I was first exposed to Filipino martial arts, around 1991. I met Annesi Sensei at a Jujutsu seminar in Boston and I began to study with him privately. I liked Annesi Sensei’s examination of principles – rather than rote technique and curriculum – and I very much like his expression of Karate, especially his analysis of Kata. Which is why I continue to study with him today. Then I had a friend from the Small Circle camps named Allen Hopkins. He lived in Kansas and I went out to train and visit with him. He had a friend who was a 3rd degree Black Belt, under Bruce Juchnik in Kosho Shorei-Ryu Kempo. That was my first exposure to that system. Some people in Rhode Island had Juchnik in for a seminar shortly after my return from Kansas. I took the seminar and that led me to become a student under him. I was especially interested in the Filipino systems he taught, which were traditional systems like Serrada, De Kadena Arnis and Largo Mano Eskrima, which are the cornerstone methods that spread from the Filipino community in the Stockton area. Bruce had learned Serrada directly form Angel Cabalas and was also a student of Dentoy Revillar. Dentoy was a top student of Angel Cabales, Leo Giron and Max Sarmiento. Bruce also was a top student of Remy Presas and taught for him at one time. He was also my first exposure to Chinese martial arts, because he had learned Qi Lin Pai from the systems’ founder, Dennis Decker. I had never really been exposed to Chinese styles before that. This was in the early to mid-nineties. TB: And you studied with Bruce Juchnik for how long? WT: Off and on for almost 20 years. TB: You also studied Pekiti-Tirsia Kali with one of my school brothers William McGrath? WT: Yes, the Filipino styles I had learned previously were somewhat specialized; I was attracted by the comprehensiveness of the curriculum in Pekiti-Tirsia. It is a strong system and gave me further insights into the Filipino martial arts. TB: How did you come into contact with Roberto Torres and Willem de Thouars? WT: Bruce Juchnik was a student of Willem de Thouars and he kept talking about Silat and Kuntao. Someone put together a camp in 1994, which brought in Willem de Thouars and one of his then top students, Roberto Torres. I was shortly thereafter accepted as a student, and started training with Robert Torres. Two friends of mine from Massachusetts and I traveled down to Long Island once or twice a month to train with Roberto over the next three years. After that time, Tuhon Roberto split with Willem, and I was more interested in pursuing the traditional styles of Silat and Kuntao that de Thouars taught, so I stayed with Willem. TB: I believe you also learned Boxing from Roberto Torres. Yes. Roberto was, and still is, a big proponent of Boxing, which he considers a very fluid expression of the principles and concepts behind a lot of combative systems, especially Pentjak Silat. Roberto also taught Filipino arts as part of the curriculum – both empty hands and weapons, from his system, Kalasag Kuntao Silat Orihinal. We did stick sparring without protective equipment. TB: And you are a senior disciple and lineage holder in both Kuntao and several styles of Pentjak Silat? WT: Yes. I learned the Bai Yun Ba Gua Kuntao system and what Willem de Thouars called Quan Chu Xing Yi Kuntao. According to Willem de Thouars, the person who brought this style to Indonesia taught three people, and Willem learned from all three. For a number of reasons, I now call it Fushan Kuntao, because the basic forms are a blend of Southern Kung Fu from Fujian and Northern Shandong Kung Fu. I also learned six styles of Pentjak Silat: Kendang, Petjut Kilat, Serak, Tjimande, Tjikampok and Tjangkring. One thing that I’d like to mention, especially in regards to those systems of Pentjak Silat, is that I learned Willem de Thouars’ particular expression and curriculum of those arts. Which is not necessarily the same as other lineages of some of those systems.